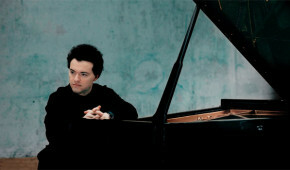 In a co-production of the Kennedy Center and Pro Musica Hebraica, Evgeny Kissin, a pianist of depth, lyricism, and power, presented an entirely unique and deeply personal program in the Kennedy Center Concert Hall: the music and poetry of East European Jewry. For the first time ever, Mr. Kissin brought together his two great passions, classical music and Jewish literature. His program featured rare solo piano works by early twentieth-century Russian Jewish composers inspired by traditional Jewish music, including Alexander Veprik’s Sonata No. 2, along with Ernest Bloch’s magnificent 1935 Piano Sonata. In addition, he recited personally selected Yiddish poetry of uncommon depth and beauty. Tonight, we present tonight four masterpieces from late-19th and early-20th century composers — from that great moment of Jewish cultural Renaissance that swept Eastern Europe and produced an extraordinary outpouring of Jewish creativity in both word and music. This turn-of-the-century flourishing saw a proliferation of poetry, theater, literary publications of every kind in the two Jewish languages of Eastern Europe: Yiddish and a newly and miraculously revived Hebrew. This same surge of Jewish national identity found expression in music — perhaps most dramatically in the composers you will hear tonight — Ernst Bloch, Alexander Krein, Moshe Milner and Alexander Veprik — who sought to create a new classical music of profound and distinctive Jewish sensibility. Tonight we celebrate both aspects of this Renaissance — Yiddish poetry and Jewish music — brought together by the two great passions of tonight’s remarkable artist, the great Evgeny Kissin. You already know, as does the world, of Evgeny’s incomparable gifts as a pianist. Tonight you will learn also about his love of Yiddish, the language of his Russian-Jewish ancestors, with his recitation of the poems of two of its greatest masters: Yitzhak Leibush Peretz and Hayim Nahman Bialik. I dare say this will be the first time Yiddish has been declaimed from this stage. At least since Jackie Mason — and that wasn’t poetry. Equally unique will be tonight’s music. The pieces Evgeny will play are some of the finest exemplars of that birth of modern Jewish music before the upheaval of revolution, the dislocation of war and the hammer of Stalin brought it to a premature halt. Which is what makes tonight’s performance so historically unique. You know the Bloch. But the other compositions – the Krein, Milner, and Veprik — have never had a concert hall performance in the United states. Indeed, have rarely been played anywhere since the 1930s. Krein’s “Suite dansee,” for example, we found buried deep in the archives of the Library of Congress. Like the other pieces on the program — and many others that never made the cut — we would send the manuscript to Evgeny. And await his verdict. Anxiously. You see, Evgeny’s return e-mails – swift and spare — were delivered with telegraphic economy, especially the “nyets” for those that did not meet his standards. Those that did meet his standards – indeed, exceeded them – will be performed tonight and for many nights to come. You will see no page turner tonight. Evgeny has taken this music to heart and said publicly he will play it for the rest of his life. One other thing you should know: Fiercely proud of his Jewishness and outspoken about the harassment and ostracism of Israelis and Israeli artists, Evgeny, on December 7, took Israeli citizenship as a public declaration of solidarity with the largest — and only sovereign — Jewish community on earth. Tonight is Evgeny’s first concert hall appearance in America as a citizen of Israel. Yet another first. Enough from me. Ladies and gentlemen, it is my great pleasure to welcome you to an evening of classical Jewish music and Yiddish poetry with the incomparable Evgeny Kissin.